Making “coopered” tankards is a somewhat involved and time consuming process. If each tankard were made one at a time it would take 3 - 4 days to make each one, or 4 - 5 days for the MarkedMen Tankard™ due to the added step of securing the ropes underneath the handle and the custom burning. The first step is cutting the "wedges" (see photo) and gluing them to form rings. Our smallest Segmented Tankard is made of 38 pieces of wood, including the handle and bottom, the MarkedMen Tankard™ is made of 16 pieces, including the handle, bottom and rope, and all of these pieces must be glued together before anything else can happen. Once the wedges have been glued together they are allowed to dry for at least 6 hours before the rings are surfaced (the gluing surfaces of each ring must be perfectly level and smooth prior to gluing the rings together to ensure a tight fit with zero gap what-so-ever) and glued together. At this point the bottom is added and the entire rough tankard is clamped together for approximately 24 hours. The rough tankard is put on one of our lathes for rough shaping and hollowing. 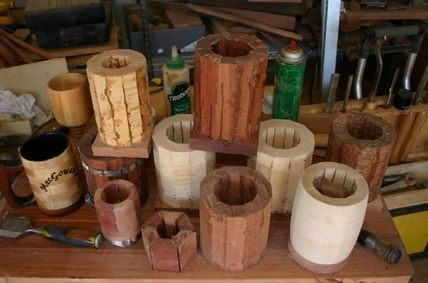 The lathe process takes about 1 to 2 hours, sometimes as much as 3 hours depending on the types of woods used, the size of the item, and how often the tools require resharpening. While the tankard is still on the lathe it is sanded. I start with 80 grit to get rid of the rough marks caused by the carving tools, then proceed to 100 grit to get rid of the 80 grit marks. 180 grit's next, followed by 220 - the wood grain is now starting to show it's true self. (This is where the sanding stops for the MarkedMen Tankards™. When the piece starts to get a nice sheen it's time to switch to 320, which creates quite a nice surface. Last, but not least is 400 grit - your Tankard is now ready to have it's bottom sanded on the disk sander and to have it's handle made. Because each tankard is different, the handle is cut only when the tankard is completely sanded and basically finished. To ready a handle we draw - by hand - the outline for the handle on a hardwood board (usually Brazilian Cherry because the boards are slightly thicker than the other woods and the thicker wood feels better in your hand). Now we rough-cut the handle out using a jigsaw or a scrollsaw. The outer and inner parts of the handle is sanded on the spindle sander to the correct shape and the handles edges are rounded on the router table. The handle is then sanded and is ready for "foot" shaping. The foot is where the handle meets the tankard and it must be rounded in to fit perfectly to the tankard's side. The handle is now glued to the tankard, then clamped and allowed to dry for 24 hours. For the MarkedMen Tankards™ the both feet of the handle must be notched to accomodate the ropes that surround the tankard. Because of the shape of these tankards the handle feet must also be sanded to a concave shape to make it fit the round, barrel-shaped tankard. This can be time consuming and often requires a few tries to get it just right. There is no way to make a jig to shape these as each tankard is completely unique. For the MarkedMen Tankards™, yet another procedure is required: the burning of the artwork and the weathering and "antiquing" process. A name of your choosing, a short quote, and either the MacGowan's Skull and Bones or your own art is traced or transferred to the tankard, then burned into it by hand. We use no laser burners here. This process can take upwards of two hours for each tankard. You can see why there's a cost difference between our standard tankards and the MarkedMen Tankards™. The process we use to cut and glue the woods for all MacGowan's products is designed to elimininate excess waste as well as to conserve time and energy. Less waste and time translates into less cost for our customers, and we are ALWAYS improving our processes and methods to save both time and costs - BUT we will NEVER scrimp on quality! MacGowan's is constantly implimenting new procedures and equipment to improve our use of energy and time. We believe in striving to be environmentally responsible in all facets of life, including our choices of wood. We know that satisfied customers are the best possible advertisment and we look at each and every product we make as a way to earn your business and possibly the business of your friends and family. If you ever run into a problem with an item you've purchased at MacGowan's please let us know - we will work with you to determine the best possible approach to resolving the problem.